Rhosneigr is situated on the South West Coast of the island of Anglesey, North Wales. There are 2 sandy bays divided by a rocky outcrop. Only the northerly one is ideal to kite surf from, due to the rock hazards. The more southerly beach (Broad Beach) tends to hold more appeal for surfers. 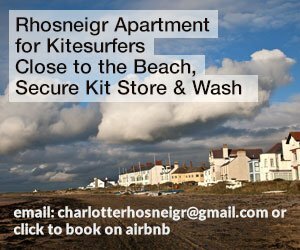 Rhosneigr typically sees 5 to 10 days per year where you can enjoy proper, classic wave riding conditions. You can enjoy relatively safe wave riding the rest of the time. It’s pretty popular with kite surfers, so you should usually be OK for someone to launch / land you. Rhosneigr will work on anything from S around to N, though it works best on S with a running swell. S/E is do-able at low tide but is very gusty. N is also gusty. Rhosneigr can be ridden at any tide state. At high tide walk around to the North, away from the shop for a safer launch. Rhosneigr is a cracking wave venue, but also has some nice shallow water near the shore for freestyle manoeuvres. On a southerly, launch way upwind of the rocks, knee deep in water, or downwind if the tide is low enough. Westerly is onshore so dangerous, non professional kiters should walk around the bay to the north until the wind is cross on. The added advantage being that it will be easier to pass the waves on the way out. Same on a north or north west wind. Don't go out in easterlies unless you fancy a Guinness after a very long swim. The river contains a lot of tin which can stain your kite, boardies etc. At high tide there can be a wind shadow to the north of the access from the bottom of Glan Y Mor Road. It's a nightmare to launch there if the wind is southerly. You need to make sure you launch toward the sea. Parking is the perennial problem in Rhosneigr. Weekends and holidays are horrendous! You can try your luck on beach road, the one leading to Funsport (if you're early enough)! There is a car park off the main street if you don't mind walking your kit for 200m (see map marker below). Some of the locals park at Glan Y Mor on Warren Road. I'm hoping at some point to get a decent feed into the site for weather, but until then here's a link to 7 day wind forecast for Rhosneigr.